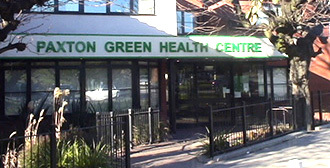 The Walk and Wait Clinic is open Monday to Friday 08.00am to 10.00am (excluding bank holidays) and is for registered patients of Paxton Green Group Practice to consult with a Doctor. Appointments for the Walk and Wait Clinic are not pre-bookable. Patients who have arrived before 08.00am will need to queue outside, whatever the weather, until the Health Centre is open at 08.00am. Patients will Check-in at reception and wait in the waiting room. Patients who arrive before 08.00am are normally amongst the first to be seen. Patients who arrive between 08.00am and 10.00am should check in at reception and wait in the waiting room. Patients are seen in order of arrival by the next available doctor or a chosen doctor if requested. All patients who arrive before 10.00am will be seen that day. The waiting time for all patients depends on the number of other patients who have arrived before them. If patients wish to be see a specific doctor, then this will normally be possible although the waiting time may be longer. In addition to seeing patients, doctors may also be answering calls on the Telephone Advice Line. We are always available over the phone to assess any patient who considers that they have an urgent medical problem. If you are not registered to book appointments online please register using our online form. We always have patients waiting to see a doctor or nurse and cannot afford to waste an appointment.